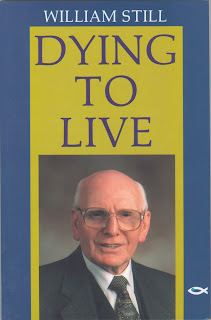 stylos: Reflections on William Still, "Dying to Live"
I recently read Dying to Live (Christian Focus, 1991), the autobiography of Scottish pastor William Still. I became interested in Still after reading his book The Work of the Pastor earlier this year. The first half of Dying to Live tells about Still’s early years into young adulthood and his beginning in pastoral ministry. Still had an unsettled childhood. His parents were separated in his early years, and his father was an alcoholic. He was a sickly child who took refuge in music and became an accomplished pianist. He was part of the Salvation Army as a young man but then entered ministry in the Church of Scotland and served at the Gilcomston Church in his hometown of Aberdeen from 1945-1997. The second half of the book deals with various aspects of Still’s pastoral ministry. Still was an evangelical. In his early ministry he worked with Billy Graham, Alan Redpath, and others in evangelistic events. With time, however, he moved away from what he came to call “evangelisticism” to develop a solid expositional ministry. Still faced his fair share of hardships during the course of his ministry. When he moved away from pragmatic evangelistic methods, for example, more than two hundred people stopped attending his church almost overnight. In the preface, he references Martin Luther’s observation that there are three things which make a minister: study, prayer, and afflictions. He observes, “He who is not prepared to make enemies for Christ’s sake by the faithful preaching of the Word will never make lasting friends for Christ, either” (p. 93). He describes one particularly difficult controversy early in his ministry when he confronted a group of disgruntled elders. At the end of one Sunday service, he read a statement confronting these men, which ended, “There you sit, with your heads down, guilty men. What would you say if I named you before the whole congregation? You stand condemned before God for your contempt of the Word and of his folk.” He adds, “The moment I had finished, I walked out of the pulpit. There was no last hymn—no benediction. I went right home. It was the hardest and most shocking thing I ever had to do in Gilcomston” (p. 124). That same week seven of his elders resigned and Still was called twice before his Presbytery to answer for the controversy. Yet, he endured. Still maintains that in light of the unpleasantness one will face in the ministry that the minister of the Word must possess one quality in particular: “…I would say that this quality is courage: guts, sheer lion-hearted bravery, clarity of mind and purpose, grit. Weaklings are no use here. They have a place in the economy of God if they are not deliberate weaklings and stunted adults as Paul writes of both to the Romans and to the Corinthians. But weaklings are no use to go out and speak prophetically to men from God and declare with all compassion, as well as with faithfulness, the truth: the divine Word that cuts across all men’s worldly plans for their lives” (p. 140). Still was a pioneer in several areas. First, he developed a pattern of preaching and teaching systematically through books of the Bible at a time when this was rarely done. He began a ministry of “consecutive Bible teaching” starting with the book of Galatians in 1947, calling this transition from “evangelisticism to systematic exposition … probably the most significant decision in my life” (p. 191). He was also a pioneer in simplifying and integrating the ministry of the church. After noting how youth in the church were drifting away, even after extensive involvement in the church’s children’s ministry, Still writes, “I conceived the idea of ceasing all Sunday School after beginners and Primary age (seven years) and invited parents to have their children sit with them in the family pew from the age of eight” (p. 171). He laments “the disastrous dispersion of congregations by the common practice of segregating the church family into every conceivable category of division of ages, sexes, etc.” (p. 173). The deaths one dies before ministry can be of long duration—it can be hours and days before we minister, before the resurrection experience of anointed preaching. And then there is another death afterwards, sometimes worse than the death before. From the moment that you stand there dead in Christ and dead to everything you are and have and ever shall be and have, every breath you breathe thereafter, every thought you think, every word you say and deed you do, must be done over the top of your own corpse or reaching over it in your preaching to others. Then it can only be Jesus that comes over and no one else. And I believe that every preacher must bear the mark of that death. Your life must be signed by the Cross, not just Christ’s cross (and there is really no other) but your cross in his Cross, your particular and unique cross that no one ever died—the cross that no one ever could die but you and you alone: your death in Christ’s death (p. 136).